Cast: Nounen Rena, Tosaka Hiroomi, Kimura Yoshino, Suzuki Ryohei, Taketomi Seika and Ohta Rina. Miyaichi Kazuki (Nounen Rena) grew up with an absent minded single mother. Her mother hadn’t shown her much affection due to her affair with a married man. Craving for her mother’s attention she shoplifts, but even that doesn’t make her mother give her any minute of responsiveness. In school Kazuki befriends a girl Eri, rumored to be a ‘loose’ girl, which furies Kazuki, as Eri has been nothing but good to her. 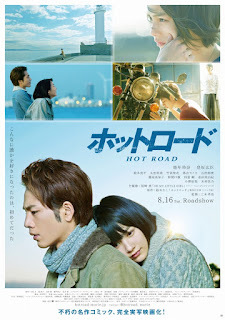 One evening Eri takes Kazuki out to meet some bikers, and there she meets Haruyama Hiroshi – who becomes interested in Kazuki. At first Kazuki is reluctant, but soon finds herself drawn to him and his world. I don’t know if you can grasp the story, but it really is nice and romantic love story. It has a lot of the ‘growing-up’ theme enrolled around it, but it doesn’t really weigh much the overall story. Somehow the leads have a chemistry, which I have a hard time figuring out. It is not a hot romantic / breath taking romantic chemistry, but rather this calm and yet youthful love. The actors where quite good, but then again I never really judge the Japanese actors – especially the ones I watch for the very first time – in bad or good actors. The adaptation comes from a manga, but I have never really heard of it, so I didn’t really have anything to compare it with.